Espresso lovers! Give in to Starbucks Philippines' newest heavenly treats. 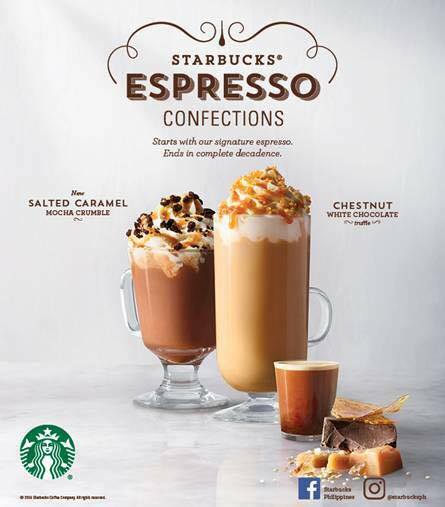 Beginning January 9, you can enjoy these two mouth-watering confections: Salted Caramel Mocha Crumble which combines all the goodness of espresso, milk, mocha sauce and toffee nut syrup. This is topped with whipped cream, caramel drizzle, Starbucks Sea Salt and brownie bits. You will also love the Chestnut White Chocolate Truffle, a combination of Starbucks signature espresso, chestnut flavor and white chocolate sauce. Topped with whipped cream and chestnut drizzle.